Snack shack sign ups: Go to http://www.signupgenius.com/go/60b084fa4ad2fa4fe3-phsgymnastics to sign up for times and items to help our team raise $$$. If you want to be added to our team calendar (so you will get notifications for each practice and meet) please email me (team Mom) at phsgymnasticsteam@gmail.com or call/text 801-350-1543. Because of the limited budget provide by the school district, donations from parents are absolutely vital to the success of the PHS Gymnastics Team. New equipment is funded solely through donations from personal donations and fundraising. Donations (not mandatory) in the amount of $200 or greater earns a free meal at our Banquet Award Dinner. All monetary contributions are greatly appreciated, Thank You! You may contribute your voluntary tax-deductible donation to Poway High School Gymnastics Team by writing a check payable to PHS-Gymnastics Team Acct. #314. Please give donations to Coach Dave. Attend Team Dinners- during the season we will have a team dinner the night before a meet. These are fundraising dinners so your attendance makes a big difference. Volunteer to help- during the season there will be opportunities to help in various ways. Introductions- This is Coach Dave's 20th season coaching Poway High Gymnastics. He has some really great stats (just ask him and he'll give you all the details). We have a new Assistant Coach, in addition to Hayley. Her name is Kelly and she will be able to assist 1-2 times per week. Practice Times and Tryouts- Tentative Practice times will be held from 4:00 - 6:00 M-F (Sat time tentatively 9-noon). Please note: if we get more girls to make each team there may be two set practice times for Jr. Varsity and Varsity. Tryouts will be held the first week of the season:Feb 19-23. Please invite as many girls as possible and share the info I've sent (or direct to our website). Policies and Expectations- Basically, be nice and support everyone on the team. Do what is expected. Do NOT talk back to coaches (3 violations will result in being sent home). Stick to your workouts and play full out. Cleaning up starts AFTER practice so it's up to the gymnasts to work together quickly in order to go home. Eat and sleep are TOP PRIORITY so take your supplements, go to bed early (and stretch often). GPA's that fall below 2.0 will result in a warning; 2 quarters will result in becoming inactive. 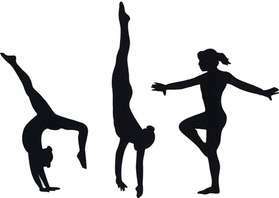 School work and grades are very important and Poway High Gymnasts have earned awards years passed, acknowledging their dedication to high academic achievements. Volunteer/ Fundraising- We earned enough funding for a new floor last season so our budget is wiped out! Much of the equipment we have is older than the girls. Coach Dave requested new mats and new equipment. (I think it would be a great STRETCH goal to get new uneven bars this year- $4,000). In order to meet that goal we are accepting personal Donations (not mandatory) in the amount of $200 or greater earns a free meal at our Banquet Award Dinner. You may contribute your voluntary tax-deductible donation to Poway High School Gymnastics Team by writing a check payable to PHS-Gymnastics Team Acct. #314. Please give donations to Coach Dave. I will be enrolling parents to volunteer to assist with Team Dinners (getting others to join us for dinner- our team will earn a percentage of proceeds) and to assist with our Snack Shack (working or purchasing items). Other Fees- Some Saturday meets require an entrance fee ($3-$5 per person). We also chip in on bus transportation for our team. I will send out more info when the bus fees are due (typically $25).